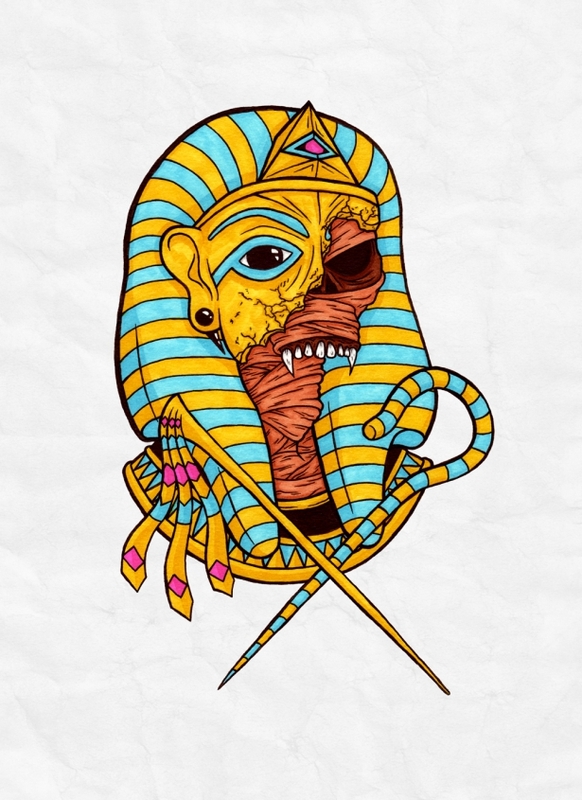 Sarah and Raphael Briskie are a husband and wife creative duo going by the name ‘Double Haunt‘. 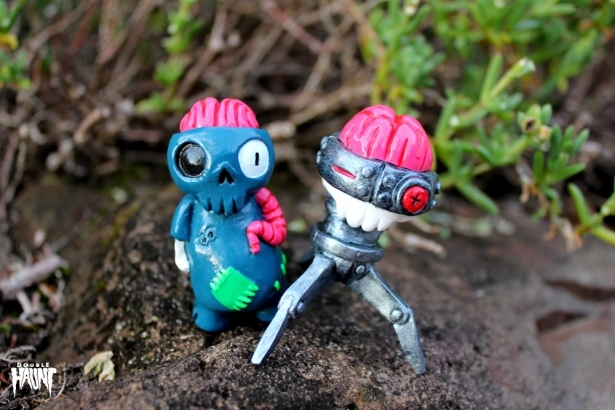 Paintings, sculpts, jewellery… You name it and the Convict Town based duo can produce it. 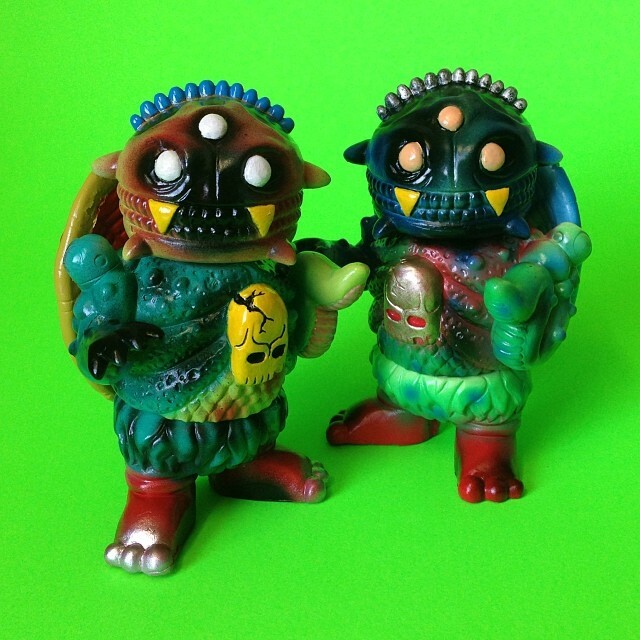 Recently ‘Double Haunt’ and Glenn Manders of ‘Bad Teeth Comics‘ have teamed up to bring the world the ‘Cheestroyer’ figure, which is currently being offered in vinyl via ‘Kickstarter‘. Describe– a memory from three stages of yr life ….basically trying to piece together Double Haunt’s pivotal moments. Concerts, art, action-figures, women, school, college… ANYTHING! R) Meeting the Power Rangers in Sydney when they filmed the MMPR movie, Basketball (it was big in the 90s), Oddbodz, Aaahh!!! Real Monsters. S) Kicking arse at karate. R) First concert (Incubus), working at Dominos Pizza and McDonalds at the same time. S) I lived in the country, worked at Woolworths… I had a boring childhood. R) Working my second gig as a graphic designer, paying bills, dabbling in art here and there (painting and some sculpture). S) Finally moved to a populated area! R) Incubus, I have plenty of other bands I like but Incubus’ style of music has changed along with my taste in music over the years so they’re the only band that I consider a favourite. S) Bullet for My Valentine, AFI, The Used, Millencolin, The Ataris, The Amity Affliction, Less Than Jake… basically punk, rock and metal. R) Teenage Mutant Ninja Turtles (1980s version), Mighty Morphin Power Rangers, The Big Bang Theory. S) The Vampire Diaries, One Tree Hill, Pretty Little Liars, Dexter, Breaking Bad, The Mentalist, Weeds, Gossip Girl, True Blood. R) I really liked basketball and tennis when I was a kid but these days I’m not athletic or really get into much sport. S) Tennis – Andy Roddick and Tommy Haas. R) The original Starship Troopers and Star Wars come to mind. S) Harry Potter movies, The Little Mermaid, A bug’s Life, Finding Nemo, Cloudy with a chance of Meatballs. I do like most types of movies except western themed movies. R) The most recent book I read was Dune, which I thoroughly enjoyed. Comics, the new Cheestroyer comic of course. Manga, I read One Piece and Naruto among others. S) Harry Potter, Fallen series, Evernight series just to name a few. R) I would like to think of it as art, we put a lot of effort into hand crafting these toys and jewellery just like an artist would spend hours on a painting. Because our chosen medium is toys and jewellery I can’t help feeling that other people view it as craft but I see every piece that we make as original art. R) I have been drawing since I can remember. Back in the 90s while I was in primary school I used to draw basketball players and trade them for all the cool snacks in my friends lunch boxes. 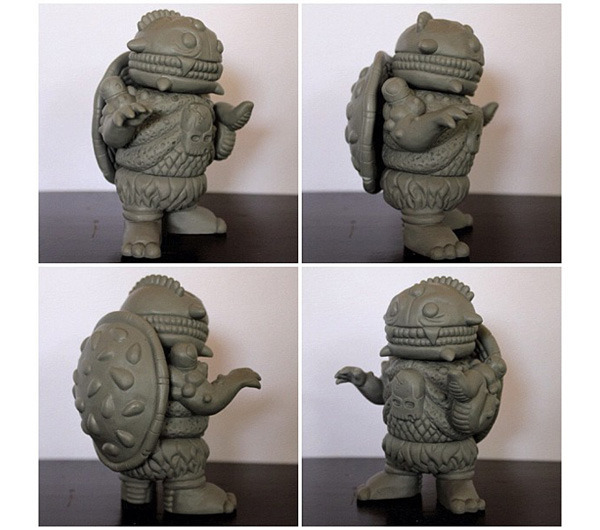 For toys, they’ve always been a big part of my life since childhood but I never really imagined making them until I picked up some clay and sculpted Mr Spook and since then I haven’t looked back. R) I’ve always wanted to be an artist professionally and have dipped my toe in here and there by participating in local art shows but I don’t think of my self as being in the “art hustle” unless that means being broke after buying art supplies. I would love to break into the toy/art industry full time with Double Haunt but until then the day job has to stay to pay the bills and support my family. R) High school art class is my only formal training (if you can call it training) but I’ve been drawing since I can remember. In terms of influence, my brother drew a lot back when I was a kid and I really looked up to him so that’s most likely why I got so into art. R) ‘Twice the scare’ …I just made that up. 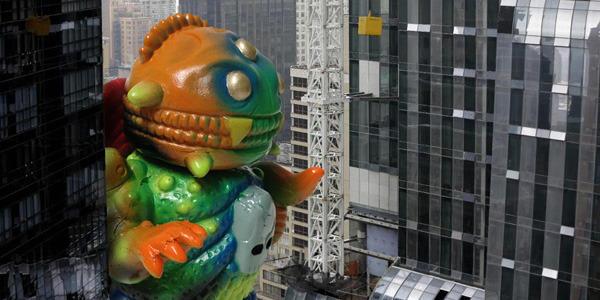 R) Paul Kaiju, Mark Nagata (he painted the Goosebumps book covers!) and a bunch of other indie toy designers and comic book artists. R) Being a needle in a large haystack of artists. R) Meeting and collaborating with and learning from other artists. R) I think it is, more people seem to be looking at toys as art and a lot of artists are starting to release toys/statues but I still think the mainstream thought is that toys are something for kids and aren’t looked at in a serious way (especially in Australia). 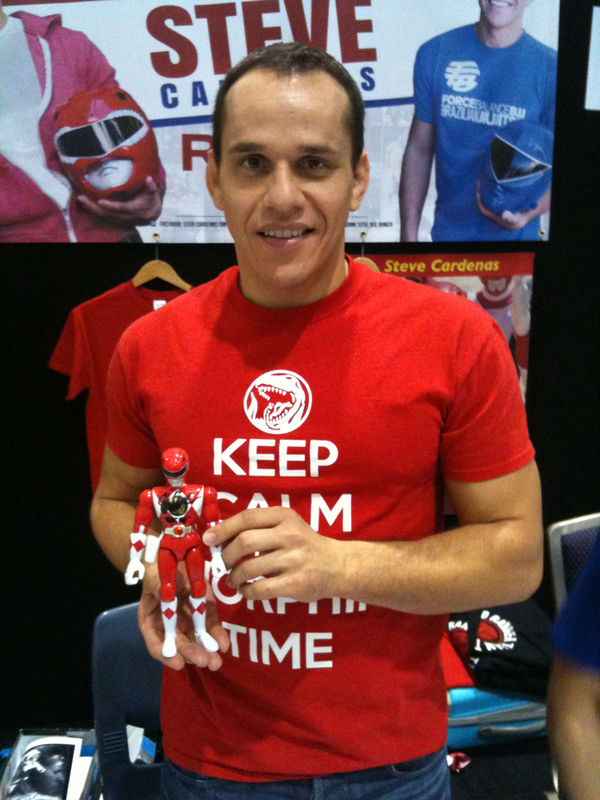 R) I’m going to have to say my MMPR Red Ranger toy which was signed by Steve Cardenas (Rocky the Red Ranger) at Supanova Brisbane last month. I have many childhood favourites though and from Double Haunt, Mr Spook is special to me since that’s the first toy I sculpted which started Double Haunt. S) From my personal collection, my Dante and Nero ARTFX statues from the Devil May Cry games. 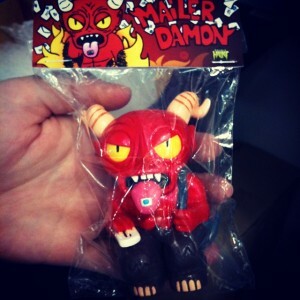 From the Double Haunt toys, the Mailer Damon, he was really cool to paint. What was the process like in collaborating with Glenn Manders of ‘Bad Teeth Comics’ for the Cheestroyer figure? R) Really cool, Glenn provided a design that really suited my “style” of sculpting and was open to the small changes from the original design. 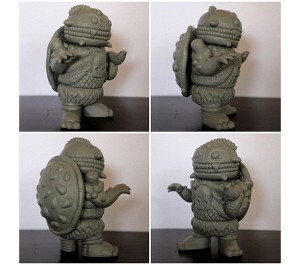 Overall the project took at least six months or more from nothing to finished resin toy. 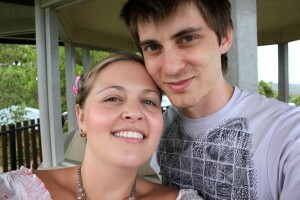 I have a lot going on with the day job (web development) so the process was a little slow but we got there in the end. You have also collaborated with ‘Square One’ on the Squares series of pieces. What is the background behind that collaboration? R) Yeah, Square One and I were introduced by the guy behind the Analogue/Digital Creative Conferences (http://www.analogedigital.com.au, I built their website). 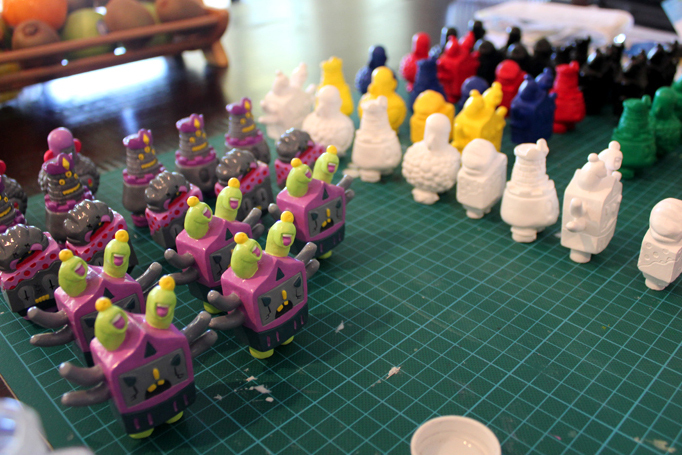 He had a series of fifty robots that he had drawn and so we chose four and I sculpted them and Sarah cast them in resin and painted all 60 toys. He also had a solo show in 2012 for which we sculpted and painted his signature character as a one off which was auctioned off for charity. Apart from that she has been incredibly supportive and encouraging when it comes to the sculpting, resin and art stuff to the point where she literally spends hours/days/weeks casting and painting the toys for me. I don’t think I would have been able to complete projects like ‘The Squares’ or the Cheestroyer without her. 1. I come up with a few ideas and run them past Sarah. 2. She critiques them and then I go back and rework the ideas until I’m happy with them. 4. I prepare the finished sculpt for the moulds. 5. I hand the rest over to Sarah. 1. I make the silicone moulds. 2. Cast the toys in resin. 3. Clean and sand the resin casts. 4. Paint the finished toys. R) Then back to me where I draw and design the header cards. S) And then back to me where I package them up and put them on the website. R) Then I do the promotional stuff for the toy. 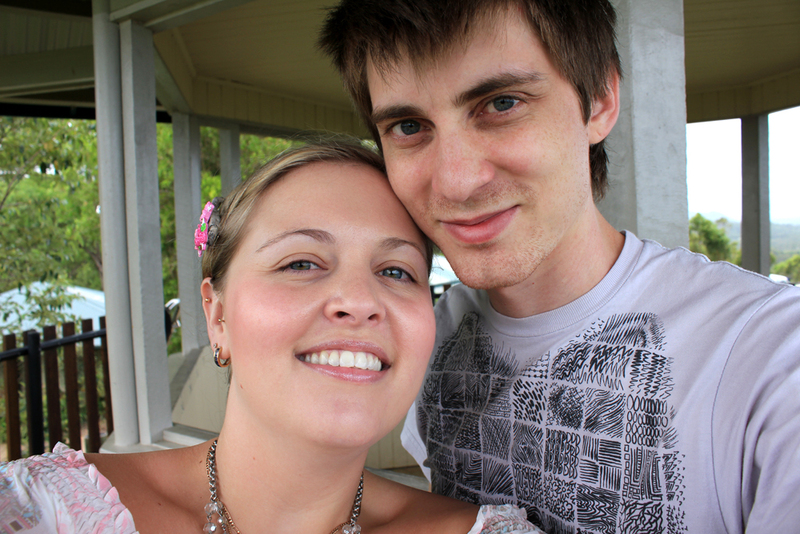 I know that ‘Double Haunt’ is a husband and wife DIY operation…What’s it like working collaboratively? R) We sort of have our set roles like I do the sculpting, artwork and occasional mould making and Sarah does the majority of the mould making and cleans and sands the resin casts and paints everything. Why the decision to enter the jewelry game with your ear-rings, necklaces and other pieces? R) We had to do something for the ladies… Sarah had some really good ideas and I wanted Double Haunt to have part of her personality in it as well so we included her ideas. 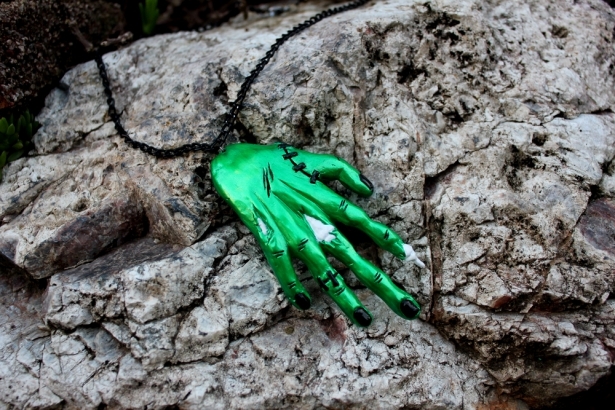 I sculpted some of the jewellery pieces like the skeleton and zombie hands and a few other bits and pieces and she took it from there. – the best aspects of Australian culture and why? R) Hmm… I’m not really aware of Australian culture so much. Maybe it’s because I don’t get out much or that I don’t watch/read the news or that I wasn’t born in Australia. – the worst aspects of Australian culture and why? R) I guess the excessive drinking and the “need” to drink just to have “fun” with mates. I’ve had friends who hated beer but forced themselves to drink it so they’d “get used to it” and fit in, idiots. Please describe what the cheeseburger means to you? R) A small burger bun, mustard, tomato sauce, reconstituted onions, one pickle, a slice of cheese and a meat patty. Cooked ten sometimes twelve at a time within the 45 seconds it took for the grill to cook the meat. I would have cooked thousands of cheeseburgers back in the day. What are your thoughts on the current rise of digital sculpting and 3D printing? R) I’m yet to see a 3D print in real life but the technology is really cool and I think I’ll eventually start sculpting digitally when the need arises but for now I really enjoy sculpting by hand. What was the experience like at the recent ‘Supanova: Pop Culture Expo’ at Brisbane? R) It was a really awesome experience, it was my first time going to anything like that so it was good to meet other artists in the artists alley. I did however expect to see more like-minded people interested in indie comics, toys and artwork. Overall it seemed like the whole event was a massive shopping centre with less focus on anything other than the latest fad and the crowd matched this by not really taking in anything other than Adventure Time, Pokemon or Game of Thrones. R) Yes, we have a few new collaborations in discussion but nothing solid enough to share. Everyone is free to contact us through the website if they want to collaborate on a toy or artwork. R) The Cheestroyer Kickstarter! 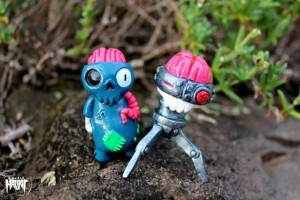 Bad Teeth Comics and Double Haunt are taking to Kickstarter to help fund the vinyl version of the Cheestroyer toy. 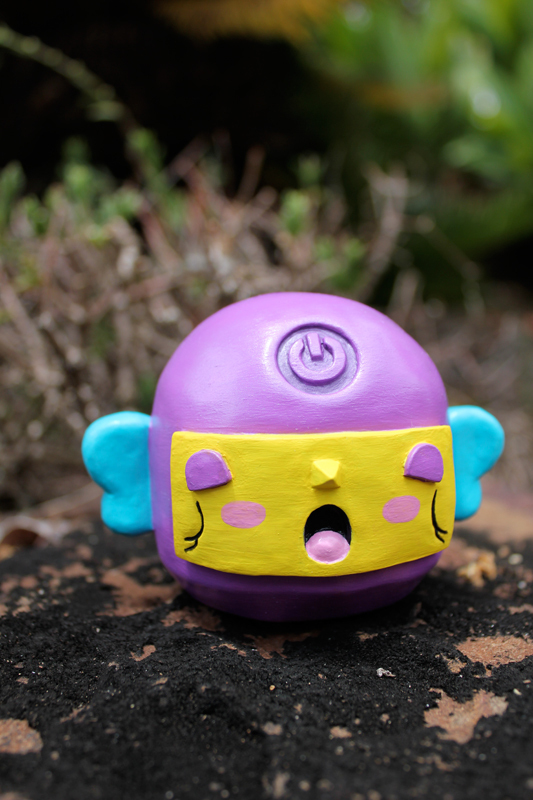 There are some awesome pledge rewards going so don’t miss out on getting a toy and helping us attempt to build the designer toy scene in Australia. 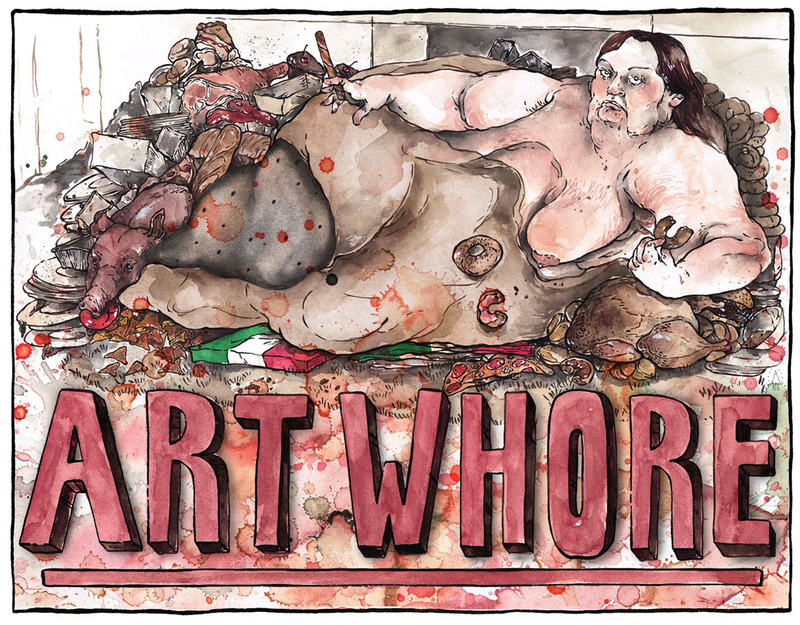 If we get funded we’re hoping to do things like an artist customised Cheestroyer art show. Check it out, make a pledge and tell your friends.